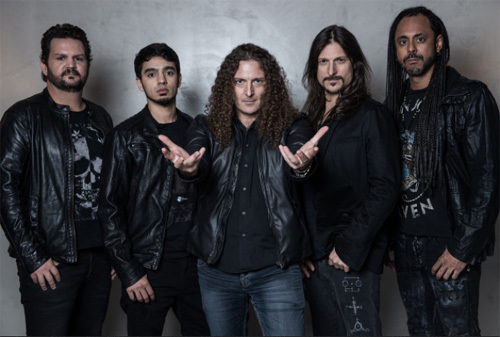 If there is any band that put South American heavy metal on the world stage, it's Brazil's Angra. Formed better than a quarter century ago by guitarist Rafael Bittencourt, Angra has dropped eight albums and toured the world extensively, sharing the stage with many of their European counterparts. Now, Angra returns with their ninth album, Omni. It's a concept album that connects the themes found in previous albums, Holy Land, Rebirth, and Temple of Shadows in to one main system. For greater detail of this concept, read the explanation that follows this review. Otherwise, on to the music then. Unless you've been living in the depths of Mariana Trench, you know Angra and their heavy metal style: melodic progressive power metal. Their sound and arrangements are expansive and technical, bombastic and soaring. By example, a song such as Insania begins with a brash opening only to drop into a bass and drum line that sounds like jazz rock fusion. This juxtaposition of heaviness and fusion continues throughout, but allowing for a ripping guitar solo in the center. Somewhat similar is Magic Mirror, where the large majestic riffage leads to Fabio Lione's voice lilting over a fusion of drums and light electric guitar. But this then yields to more aggressive power metal, getting heavier and leading to a middle solo. Then at the 4:30 mark the power metal bluster abruptly ends, allowing for a breakdown of piano, symphonic synths, and a smooth bass line. The power metal returns quickly from this, yet the song ends with a subtle guitar outro. With Caveman, you get something of an aggressive power metal rocker that fits the song title. Things race along with underlying groove until the 3:30 point. There, a fusion of bass, guitar, and drums lightens the arrangement, and then leads into another powerful guitar solo. Alternatively, with Light Of Transcendence, Travelers In Time, and War Horns, you find Angra advancing with more traditional and pure power metal. The songs are fast, bracing with riffage, and soaring with frisky guitar solos. After this, there are two power metal anthems with the lighter Always More and the expansive and soaring The Bottom Of My Soul, where Lione is at the top of his game. If there was any disappointment here, it came with Black Widow's Web, which features an (unknown) female vocalist, but also has somebody doing some distracting death vocals. Nevertheless, Angra's Omni is another exceptional album of melodic progressive power metal from this seminal band. I would expect nothing less. Get it. Easily recommended. Omni is a concept album, a set of science fiction short stories that take place at various places in time, simultaneously. The backbone of the plot is based on the idea that in 2046 an artificial intelligence system will change human perception and cognition. It is a system which will allow conscious communication between present and future human beings. Characters such as time travellers, cavemen, warriors, among others, help tell this story. The album connects the concepts of previous albums (Holy Land, Rebirth, Temple of Shadows) to one main system, Omni, which in Latin means "everything." Omni fabricates an interconnectivity that shines light towards a universal truth: everything that has happened, led to what the band is today. Omni celebrates and unites the whole history of Angra to this exact, current moment. Angra's Omni is another exceptional album of melodic and progressive power metal from this seminal band. I would expect nothing less. Get it. Easily recommended.